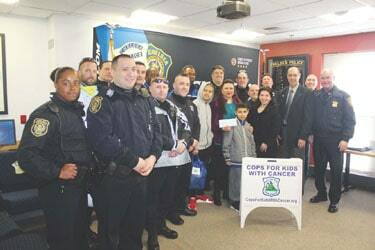 Cops For Kids With Cancer collaborated with the Chelsea Police Department collaborated to present a donation to a local family during a ceremony at the station. Through a translation by Chelsea Police Officer Sammy Mojica, Sandra Ingles said her family was “very grateful” to the Chelsea Police and the Cops For Kids With Cancer charity for their assistance during this tough time. Captain Mike Drummy of the Massachusetts State Police said families are referred to the charitable organization by local police departments and social workers. The organization has donated more than $3 million to families.